Each frame is built with kiln-dried solid hardwood, with hardwood laminates in shaped areas. Joints are braced with corner blocks that have been glued and stapled for maximum strength. We believe a well-built frame is the basis of long-lasting furniture. We are confident in our construction and offer a Lifetime Warranty on our frames and spring suspension. Artistic Leathers is one of a handful of manufacturers who continue to offer eight-way hand-tied coil springs, a hallmark of quality construction. 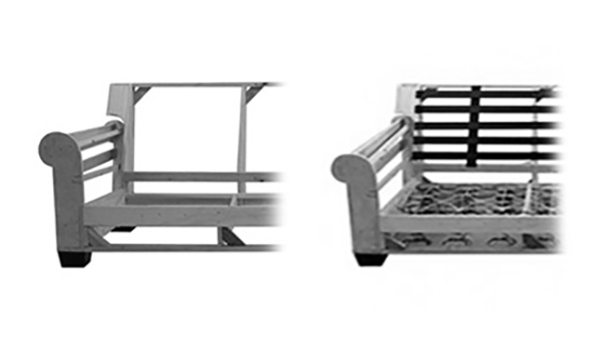 This traditional process involves tying eight knots on each seat coil with heavy cord, ensuring uniformed seating support and long-lasting comfort for many years. Special talent is required to sew natural leathers, and the artistry in these details show beautifully with perfect stitching. Working with special heavy duty and state-of-the-art sewing machines, our sewers take pride ensuring that quality stitching is maintained in every piece. From decorative top stitching to supportive baseball stitching, sewing is one of our building quality design’s foundations. Our master upholsterers have trained eyes for specific upholstery details, ensuring quality finish for every Artistic Leathers piece. With hand-set pleats and rolls, each piece is bench-made one piece at a time to ensure a quality appearance and durability. Many of our styles feature true tufting, which is a century-old method of upholstering requiring special skill and years of training. This process requires the upholsterer to create even pleats within the leather so that all tufts are correctly proportioned. Heavy duty twine is passed through upholstery layers, then pulled and secured in the back with a special knot, securing the front button. Our seat cushion cores are built with pocketed Marshal coils cradled in multiple layers of soft and resilient foam that springs back in shape, much more stable than simple polyurethane foam. Cushions are encased in multi-channeled feather and fiber blend jacket for a plush cloud seating type. Back cushions are also channeled to avoid migration of filling materials as well as to maintain shape and comfort. Our artisans have been trained for countless hours to develop their talent for hand antique finishing to give our styles an individual and recognizable finish. This multi-step process is performed after the sofa been upholstered, giving it a timeworn, antique look, as if it has been a family heirloom for many generations.